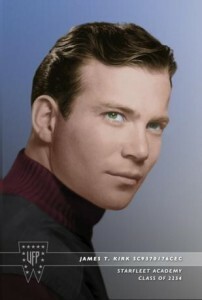 Review: The Autobiography of James T. Kirk by David A. Goodman – Escape Reality, Read Fiction! 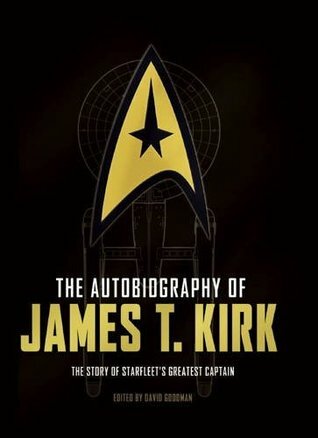 The Autobiography of James T. Kirk chronicles the greatest Starfleet captain’s life (2233–2371), in his own words. From his birth on the U.S.S. Kelvin, his youth spent on Tarsus IV, his time in the Starfleet Academy, his meteoric raise through the ranks of Starfleet, and his illustrious career at the helm of the Enterprise, this in-world memoir uncovers Captain Kirk in a way Star Trek fans have never seen. Kirk’s singular voice rings throughout the text, giving insight into his convictions, his bravery, and his commitment to the life—in all forms—throughout this Galaxy and beyond. Excerpts from his personal correspondence, captain’s logs, and more give Kirk’s personal narrative further depth. 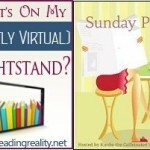 I bounced off of two fairly serious books, and found myself staring at today with nothing to post. I gave up my attempts at serious for the week and turned to the book that was calling my name, loudly and with 60s theme music. As the 49th anniversary of the debut of a quirky little science fiction TV series called Star Trek occurred this week, it seemed like a fine time to dig The Autobiography of James T. Kirk out of my TBR pile. Just in case you’re wondering, this is the story of the first James T. Kirk. Or perhaps the “Original Kirk”, in line with the naming convention of referring to the 1966-1969 series as “The Original Series” or TOS. The framing story that sets up the book is interesting in and of itself. It is purportedly edited from a recording that Kirk made at Memory Alpha just before his “death” on the maiden voyage of the Enterprise-B. Kirk was a ceremonial guest at the launch, but ended up saving the ship and being swallowed by an energy vortex when the ship was attacked. He saved the day (again) and was lost, presumed dead. Kirk’s last words were, “It was… fun. Oh my…” This Autobiography is a fleshing out of exactly what it was that was so much fun. And sometimes so much tragedy. While the book is part of the convention of fiction that is written as though its protagonist was a real person, in the same way that the Sherlock Holmes stories are purported to be written by Dr. John Watson about his friend Holmes and merely edited by Conan Doyle, this book can be read as a fleshing out of Kirk’s biographical entry in our version of Memory Alpha. It takes all of the incidents that are known from the series and movies, and turns them into a complete portrait of a fictional life. Because the story is told from Kirk’s perspective, we see things that we did not see on film. Kirk was so often a “cowboy”; cocky, self-assured, sometimes self-absorbed, and always coming out on top with a smirk or a smile. Through his eyes in this autobiography, we see all the times when that was an act, that the outward confidence often masked an inwards doubt. And sometimes a bit too much hubris. The other thing that this book does well is put some meat on the bones of the story we heard bits of but didn’t see – both his childhood and the years after his retirement from Starfleet. 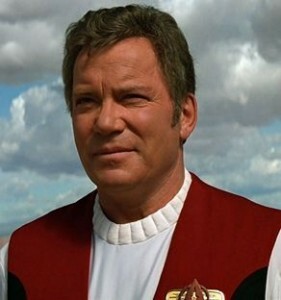 In the episode Court Martial, there is a recitation of all of Kirk’s many, many medals and awards. In the book, we see how he got those awards, without him talking about them directly. We read about the tragedy that led to Kodos the Executioner (The Conscience of the King), and the insanity of the Axanar peace talks. And there is plenty of information, and plenty of regret, in Kirk’s relationship with the son he virtually abandoned. While the story does touch on some incidents from the TV episodes, it does not become a catalog of them. Only the incidents that impacted on the life of this fictional person get any mention. So we read his perspective of The Doomsday Machine and Obsession, but not The Trouble With Tribbles. And the inclusions and exclusions feel right. Escape Rating B+: This is, without a doubt, a book for the fans, especially fans of the original series. For readers like me, who loved that show and remember it with extreme fondness, it is an absolute treat of a book. I read it in one sitting, mostly with a smile on my face. And occasionally with a pang in my heart. Which makes it a difficult book to rate. I loved it and was lost in it, but that has as much to do with my own nostalgia rather than it does the book. For those who loved this show, even with its many faults, the throw away treatment of the events in the laughably awful movie Star Trek V: The Final Frontier, is guaranteed to bring a chuckle. On the other hand, this book is no way to introduce anyone to Star Trek: The Original Series. And possibly not for fans of the reboot who are wondering what all the fuss is about. But for those of us who already know what made this show so marvelous, this is a chance to slip back to a universe we all remember with love. 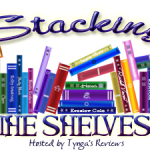 Pingback: Stacking the Shelves (152) | Escape Reality, Read Fiction! I really want to read this. But I have to say that I refuse to believe Kirk is really dead. Nope, somehow, on some plane of existence, he endures forever. At the end of the book, there’s an afterword by Spock. He would agree with you.